The business benefits of healthier buildings are driving investor attention to ways they can systematically and comprehensively compare corporate wellness interventions. NEW YORK, Sept. 21, 2017 /3BL Media/ – Businesses, real estate professionals, and investors who are interested in increasing financial value should be taking strong interest in the healthy building movement, a new report by DelosTM reveals. 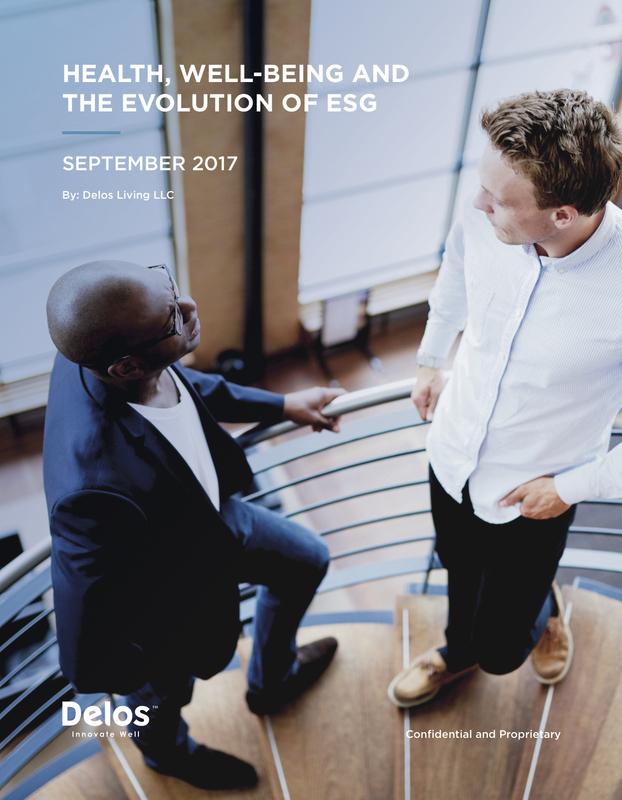 The report, “Health, Well-being, and the Evolution of ESG,” explains that the promotion of employee health and well-being is emerging as a key new material element that investors should be demanding in Environmental, Social, and Governance (ESG) corporate reporting. Driven by advances in technology and automation, the demand for knowledge work (i.e., the office professional) is now rising faster than industrial work (i.e., the factory worker) – and predominant health concerns for knowledge workers are different than industrial workers. Office workers are more often affected by chronic diseases, illnesses, and injuries rather than acute injuries or infectious diseases that more frequently occur in manual work with machinery or hazardous materials. It is estimated that chronic diseases cost employers in the United States up to $1.1 trillion every year. Appropriate and effective health, well-being, and safety interventions are, however, a bit different for knowledge workers. Measurement of these health-related interventions may help businesses develop strategies to manage risk, reduce healthcare costs, reduce absenteeism/turnover, and increase productivity and employee engagement. In fact, several peer-reviewed studies, using simulation and past market performance, show that businesses with strong employee health and well-being programs outperform the S&P 500 significantly. Third-party verified healthy building certification systems such as the WELL Building Standard™ could therefore be one of the best health promotion metrics for investors to examine. Building certification programs offer investors a unique opportunity to measure passive health promotion interventions in a systematic, comprehensive, comparable way. About Delos: As the pioneer of Wellness Real Estate™, Delos is transforming our homes, offices, schools, and other indoor environments by placing health and wellness at the center of design and construction decisions. Delos helps create spaces that actively contribute to human health, performance and well-being by marrying the best innovations in technology, health, science, and real estate. The Delos platform includes programming, design, consulting, research, and an array of innovative solutions and technologies designed to improve health and well-being. More information on Delos is available at www.delos.com. Pollard TM. Western Diseases : An Evolutionary Perspective. Cambridge University Press; 2008. Ross DeVol, Armen Bedroussian, Anita Charuworn, et al. An Unhealthy America: The Economic Burden of Chronic Disease. ; 2007. http://www.milkeninstitute.org/publications/view/321.